Hello ! I am Isa from Switzerland ! 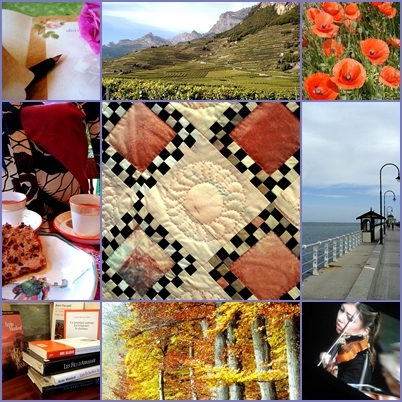 Here is a mosaic of images that will tell you a little bit more of me, images of places I enjoy being in (nature, the Alps, the seaside), activities that are very much part of my life like writing, quilting, reading). Music I love too, all sorts of musics depending on my mood. I am happy to share them with you and hope you will enjoy visiting my blog now and then. Thank you all ! PS: please, kindly respect copyright. All photos are mine, don’t use them without my explicit consent. Thank you. I have just enjoyed a quick tour through your blog. I like it and I’ll be back. I also have enjoyed very much my tour through your blog! …. and really enjoyed reading the poems you chose. I particularly love your post about your beautiful little beagle pup. Animals bring so much joy into our lives don’t they…. and it’s lovely he found such a nice spot to lay in when he first arrived – on top of your quilt basket – which obviously also brings you much joy! Thank you for your beautiful photography and interesting subjects. I particularly like the one on Africa. (I long to go there–plan to visit in 2010). Your country is so lovely. I remember the cowbells gentle chime and the colorful wildflowers in the Alps! Continue sharing your bright colors and landscapes – AND QUILTS! Very attractive blog! Keep up the good work! Suggest wonderful, thoughtful photographs & writing in your posts! I will follow you with interest. Hello, it’s a pleasure to met you, thank you for your kind comments! Thank you Cassie, smartpeopleiknow, dhome510 and robynfuoco. I am very grateful for your visits and encouraging words. Have a Happy New Year everyone, I look forward to visiting your blogs too ! D’ailleurs très joli tes photos, j’aime beaucoup. I was just looking through your blog, many lovely things, found a lot in common; click, Africa I have a special bond with Africa, having been born there, click,Switzerland, I have often stayed in Caux sur montreux overlooking the rhone valley. click textiles and quilting I am trained as a teacher in textile art though I teach English at the moment. Thank you for nice comment on my bread and the recipe for your bread. I’m enjoying reading the heart felt writing on your blog. miekmiek, how amazing we have so much in common. Africa is dear to me too. My second son is of African origin. I just posted a photo of Caux on Flickr. As for textiles and quilting, I’d love to learn more about your teaching and art. Kathy M, thank you for your visit and comment, I look forward to visiting more of your blog. Nice to read you Barb. I was in Geneva for a few days last week. It is a lovely city, just the right human size. Being at the lakeside adds something special, I think. Enjoy Roma in the Spring and thanks for your visits. Thanks for stopping by my blog. Thought I would return the visit.What inspirational photographs, words and lovely handwork! I will certainly come back and wander through your pages. It has inspired me to try to be more creative in the photography of my work. Lovely to find you here, innersanctumgals. I’ll be happy to see more of your blog too, quilts and all you feel like sharing. Thank you for your visit and comment. Hello Isa, thanks for the visit to my blog, without which I would not have found you. I’ve just spent the better part of the past hour reading your posts and looking at your lovely posts. Merci Cindy for your kind words. It is nice to read you too, I like the variety of your subjects and photographs, the humour, the thoughts your writing inspire. Thanks for all your share ! I have a little holiday through your blog and how refreshing it was. I am a quilter and also enjoy travelling. The images you have a captured are just lovely…I will be back to take another holiday soon. G’day Carol ! Nice to see you here. I just went on a tour through your blog and enjoyed it a lot, quilting and all. I loved the way you wrote about “a little holiday through my blog”, thank you very much. I teach art in the heart of the midwest, Minnesota, USA. I am teaching students to use African textiles for inspiration in their paintings. Particularly, we are working with patterns and color. May I reference your African Mosiac quilts? I would like to show them to the class, as they work on composing their own designs based on African textiles. You are most welcome to use my African textile mosaic as an inspiration for your students. I feel honored. African textiles and patterns are well worth beeing looked at more closely. I suppose you are aware of some very interesting books on the subject (African-American quilting)? I would also love – if that is at all possible – to see what your students did in their paintings (pictures maybe ?). Good luck with your teaching and students’ inspiration. Thank you for the warm response, Isabelle! Is there a way for me to send you images of the work the students create? I have a student who brought in authentic fabrics from Kenya. Other than that along with what we have found on the internet, I have a lot to learn. I would love any book recommendations you may have. Merci pour votre commentaire cela me fait toujours tr èsplaisir. Il me semble que vous devez connaitre les Grangettes, je vais me rendre à L’AG de Patchquilt suisse peut être vous aussi? Merci aussi de votre visite, Marianne. Oui, je connais les Grangettes, un bien bel endroit. Je ne serai pas à l’AG de Patchquilt; je vous souhaite une belle journée d’échanges et d’amitié. May I use a copy of your “autumnal quilt” for my senior honors thesis at UNC-Chapel Hill in the USA to illustrate piecing? Yes, you are welcome to use a copy of my “Autumnal Quilt” for your thesis at UNC-Chapel Hill. What is the thesis about, if I may ask ? I would appreciate you giving credit to the quilter 🙂 Thank you and best wishes. A Canadian journalist I follow, Ian in Hamburg, made me aware of Antony Gormley’s project called Horizon Field. It’s in your neighborhood, so to speak, and you may know of it. If not, I’m sure you’ll enjoy reading about it. There’s a map of all the installations in the left sidebar of the Project. It’s simply entrancing. Isn’t it wonderful what people will do? Thanks for sharing such an interesting link, Linda. This Horizon Field is a fascinating project well worth visiting some day. Vorarlberg is about half a day’s drive from my place, I guess. I have seen open air art exhibitions before but never one to such an extent. Beautiful. I appreciate your telling me of it. Today is the shortest day of the year. Consequently your mothers star will shine for you the longest possibly. May it send you good wishes for Christmas and the coming year. Hopefully you are not in acute need for a guarding angel. What touching words, Carsten, thank you. Today is precisely the day my mother joined these guadians angels 8 years ago. A short day indeed and a very dark night. I know and feel my angel will shine when needed. I wish the same for you and yours, every day of the New Year. Hello taccarinoinitaly 🙂 how lovely to read you again. I feel sorry I have not been very present lately but I did take time to visit you and enjoyed it so much. Like a holiday in a country I just love. I appreciate your sending me the link of the website about fabrics. What an impressive choice ! It is great, thanks a lot for thinking of me. Have a wonderful Spring weekend ! You have a fascinating site here, which serves as a perfect metaphor for a quilt. Each of your varied topics are woven with the various threads of your thoughtfulness, enthusiasm and creativity. Nice job! Thanks for your warm comments at my site! Hope to see more posting. John, thank you for your touching words. They came at such a right time. I will post more. For now let me just thank you warmly for your visit and thoughts. I am writing on behalf of Kan & Lau Design Consultants, a design firm in Hong Kong. We are currently working on a project with the HKSAR government doing a research on the relationship among a few neighbouring districts, how they developed in recent decades and the mutual influence upon each other. We particularly like your photo of spiral on a wooden fence posted on 18th March 2011. We hope to use that photo to illustrate a design theme we have come up with, the flow of life in the lines, through its seemingly static form is close to our concept. I would like to ask for your permission to use your photo in our report. It is a non-commercial project. Please kindly email me if you have other questions. Thanks a lot for your words, I appreciate that you asked about using one of my pictures and feel honored about it. I had totally forgotten about this wooden spiral on an old fence up in the Swiss Alps. Nature sometimes takes over what men are constructing and blends in nicely. Yes, you may use this particular picture for your non-commercial project iif it can help you illustrating your design theme. The “flow of life in the lines”… just this morning I read a chapter in a book (Anam Cara) by John O’Donohue, Irish writer and philosopher, about Celtic Wisdom and the circle of life. No linear concept for life but an unending circle. Very inspiring. Thank you Cécile, so happy to have found you during your stay in Zurich. Love reading you. Your blog is among the prettiest that I have seen. Quite lovely with your very good photographs. Oh, what a compliment ! I started blogging because I like writing, decided to do it in English so that I could still practice and learn from you all and also because I really enjoy taking pictures. So, thank you very much for your appreciation. I am touched and grateful. Hi Isa! I’ve nominated you for the WordPress Family Award. Hope you don’t mind. If you want to accept, use this link http://tamaraeckstadt.wordpress.com/2013/05/08/wordpress-family-award/ You don’t have to. But I hope you’ll stop by and read what I said about you. Thanks! Thank you so much Tamara, I appreciate your Family Award and will certainly stop by and read your words. I appreciate you. You have a very beautiful soul. You are a very good artist.Your photographs are very beautiful and impressive. I like your blog much. I’ll always come back to see your photographs and writings. Dada, how very nice to find you here ! Thank you so much for your visit and kind words. It touched me deeply. Isn’t the web a small place and beautiful garden ? Flickr, Istanbul, isa’s threads and happy mailing. I am grateful we came across each other’s sites. Thanks a lot EM, I appreciate your words and look forward to seeing more of your own blog. I wonder if I might bother you to email me – I have a question about a drawing I found whilst thumbing through your blog that I have great interest in for personal reasons. I understand if I do not hear back from you, but would be great if I did (there are only two “Jesse Leiker’s” on facebook – I am the one in Colorado). Hello Jesse and thanks for your message. What post/drawing are you interested in on my blog ? I will be glad to help if I can. https://isathreadsoflife.files.wordpress.com/2013/09/coimbra-azulejos.jpg?w=384&h=576 Please can you tell me, where you take this picture (Universidade de Coimbra) ? It’s VIA LATINA? Yes, I think so. On the first floor, before reaching an inside gallery in an unassuming corner. I thought it looked like a forgotten piece of art well worth showing. I will have a look at my pictures of this beautiful journey and tell you more if I can. Thanks for your visit. You are so accomplished ! Beautiful blog with a heart.Cheers. Your words touched me, Sidran. Doing anything with the heart brings much pleasure. Thank you. Hello Isa, is your blog still active? I am in love with one of your quilts and would like to know more about how you constructed it. Your work is fabulous!! Hello Barbara, thanks for your appreciation of one of my quilts. Which one do you mean ? My blog has been “out of order” for a while though, sorry about this.